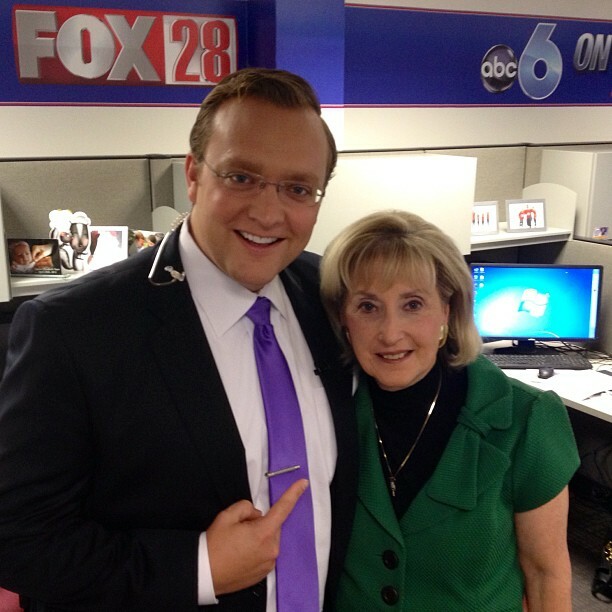 There has never been anyone I have met that is as dedicated to reporting like Carol Luper. She lives and breathes her job and after decades here at the station, she is finally retiring. I highly doubt you will find her sitting still next week. I am off the upcoming days (finishing a nine day stretch) so I wanted to get a quick picture with her before she clocks out the final time. I am still wondering what she is going to do with her little phone book with EVERYONE's phone number from Central Ohio. You want the Med Flight pilot's number? Maybe the grounds manager for the Columbus Clippers... She probably has it. So long Carol! Blessed to have work with you and learn from you. On to the weather. There are a few showers already starting to fire up before Noon. There is PLENTY of energy for these showers and storms, but they will likely be scattered. The broken line of showers and storms will push through Central Ohio through midday and I would not be surprised if the outflow from the storms trigger more cells later in the day once we regain any energy lost. The cold front will push through tomorrow. So today will, once again, be in the 90's for our highs. As long as we hit 90 (rain over the airport will keep that from happening) we will have a heatwave. Tomorrow will be our transition day with a better chance to see rain and cooler temperatures pushing in. Friday looks fantastic and cool then chilly for the mornings this weekend. Enjoy the pool today... It may be the last 90 degree day of the year. Have a good one!